Psycards works by images, metaphors and similes. It is unlikely you are in prison, but you may feel that it applies to one aspect of your life or someone else's. 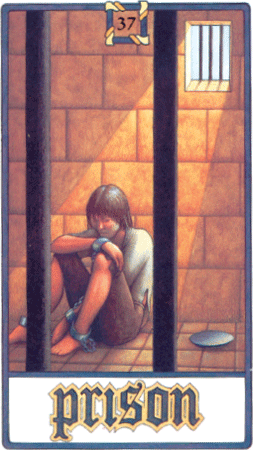 Prison can mean being trapped into a relationship or a marriage that seems like a life sentence. You may be shackled by disability or ill health. Your job may be a dead end or a constriction of your real talents. And of course poverty is a prison too. Some of the questions the Prison Card asks is what crime you are in for, were you guilty of it and who is your gaoler. Very often as individuals we get punished by the consequences of our actions. Very often we punish ourselves through feelings of guilt and shame.